Advancements in the science of concrete materials have led to the development of a new class of cementitious composites called ultra-high performance concrete (UHPC). UHPC exhibits mechanical and durability properties that make it an ideal candidate for use in developing new solutions to pressing concerns about highway infrastructure deterioration, repair, and replacement. (1,2) Field-cast UHPC details connecting prefabricated structural elements used for bridge construction have proven to be an application that has captured the attention of owners, specifiers, and contractors across the country. These connections can be simpler to construct and can provide more robust long-term performance than connections constructed through conventional methods. (3) This document provides guidance on the design and deployment of field-cast UHPC connections. UHPC is a fiber-reinforced, portland cement-based product with advantageous fresh and hardened properties. Through the appropriate combination of advancements in superplasticizers, dry constituent gradation, fiber reinforcements, and supplemental cementitious materials, UHPC is able to deliver performance that far exceeds conventional concrete. Developed in the late 20th century, this class of concrete has emerged as a capable replacement for conventional structural materials in a variety of applications. Like conventional concrete, UHPC is composed of a variety of constituents that are combined together in a mixer to create a semifluid product that can be placed into formwork and, with time, will develop a particular set of properties. The common constituents of UHPC include dry components, fiber reinforcement, chemical admixtures, and water. Because UHPC, like conventional concrete, is defined by the properties of the composite material, multiple formulations may produce similar characteristics. (4) The following information on constituents speaks to common UHPC formulations. As with all concretes, UHPC formulations must be developed with a focus on a range of performance considerations. Compatibility of constituent components is a key consideration. Exact compositions, particle geometry, and reactivity may vary. Any modifications of existing mix designs or products through the addition or subtraction of constituents should be completed with care. Dry components comprise the majority of the UHPC constituents. These components include portland cement, silica fume, and fine aggregates. UHPC formulations may also include small coarse aggregates and supplementary cementitious materials. A variety of portland cements are produced in the United States, each performing in a specific way. The portland cement used in UHPC may be produced to meet the standards of ASTM C150 and/or American Petroleum Institute Specification 10A. (5,6) Class H oil well cements are frequently included in UHPC mix designs. Silica fume is a key component in UHPC because of its reactivity and its small particle size. UHPC commonly includes a high proportion of silica fume (10 percent or more relative to the weight of cement). The fine aggregates are proportioned and sized to allow a gradation of dry constituents that facilitates flowability in the fresh UHPC. A variety of fine aggregates can be appropriate for use in UHPC, including quartz, limestone, and basalt. Coarse aggregates are sometimes included in UHPC formulations. These aggregates tend to be relatively small (1/4 inch (6 mm) or less) and included at low proportions compared with conventional concrete. Other supplementary cementitious materials-including fly ash, metakaolin, ground granulated blast furnace slag, and limestone powder-have been considered for inclusion in UHPC formulations. 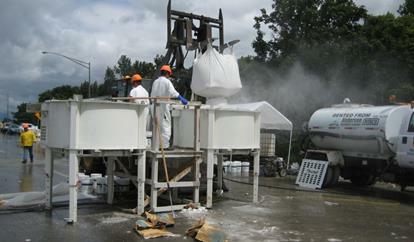 The types of chemical admixtures used in UHPC are readily available in the concrete industry. These admixtures commonly include accelerators, polycarboxylate-based superplasticizers, and phosphonate-based superplasticizers. Other admixtures could also be used in support of a specific need on a particular project. These chemicals are proportioned according to the project requirements to provide the thixotropic, self-consolidated properties of the UHPC in the unhardened state and to encourage specific post-placement material behaviors. Because of the broad availability of these types of admixtures, these products do not normally raise concerns with regard to use of proprietary products on publically funded construction projects. The cementitious reaction that is inherent to the use of portland cement-based composites requires an adequate supply of potable water. Common requirements for water quality and water control relative to conventional concrete are also applicable to UHPC. The temperature of the water during its addition to the mixer has been demonstrated to play a key role in achieving appropriate fresh properties. Chilled water and/or ice are commonly used to reduce the temperature of the UHPC during mixing and placement. This temperature reduction facilitates an increase in the fluidity of the mix and a reduction in the rate of free water evaporation from the mixed UHPC. In addition, cubed ice has been demonstrated to increase the efficiency of the mixing process by providing both increased mixing action in the powder-rich UHPC formulations and a sustained supply of water throughout the mixing process as the ice melts. All ice should be melted before the addition of the steel fiber reinforcement. Steel fiber reinforcement is a critical component of UHPC when used in structural elements or field-cast structural connections. The exceptional mechanical properties of UHPC can be largely attributed to the fiber reinforcement. These properties cannot be achieved without inclusion of specific fibers that afford appropriate fiber efficiency to the composite matrix. Fiber efficiency is influenced by the fiber type, geometry, volume fraction, dispersion, and orientation. Both mix design and casting technique contribute to the final mechanical performance. A UHPC mix design or product must include specific information regarding fiber type, geometry, and volume fraction. The cementitious composite formulation is commonly designed in conjunction with the fiber reinforcement constituent to deliver the requisite fresh and hardened properties. The field-cast UHPC connections described in this document require steel fiber reinforcement included at very high volumes as compared to conventional fiber reinforced concretes. The fiber proportion by volume is normally 2 percent of the volume of the overall UHPC composite. Steel fiber reinforcement provides superior crack-bridging capabilities compared with other lower-stiffness fiber reinforcements. The steel fibers are typically made of high-strength steel to ensure that fiber tensile failure does not occur. Fibers may be straight or deformed. The most common steel fiber deployed in UHPC applications is a 0.008-inch (0.2-mm) diameter by 0.5-inch (13-mm)-long straight fiber with a specified minimum tensile strength of 290 ksi (2,000 MPa), which is shown in figure 1. Domestic production of this type of fiber is available for projects that must adhere to the Buy America provisions of Federal law. Figure 1. Photo. Commonly used steel fiber reinforcement. The sophistication of the UHPC cementitious composite, when compared with conventional concrete, has led to the development of a worldwide network for the production and distribution of preblended UHPCs. Typically, multinational construction-materials suppliers produce a set of products in this class. The dry constituents, chemical admixtures, and steel fiber reinforcement are delivered to the project site, where they are mixed with water to produce the fresh UHPC. This production and distribution model is similar to the one commonly used for many of the proprietary grouts and patching materials frequently deployed in the construction of public infrastructure. FHWA released a memorandum on the topic of UHPC on February 12, 2014. (7) This memo addressed the topics of domestic supply of steel fiber reinforcement as well as proprietary product considerations. The memo also included two attachments. Attachment A provides the New York State Department of Transportation (NYSDOT) UHPC specification dated April 19, 2013. Attachment B, titled NYSDOT UHPC Implementation Notes, speaks to specific applications and considerations from the perspective of the owner. Individuals and owners considering the use of UHPC for field-cast connections are encouraged to consult this memo. The material properties of a widely available, preblended UHPC have been independently assessed through a series of research projects completed by FHWA. (See references 8, 9, 10, and 11.) When deployed with 2 percent by volume steel fiber reinforcement and cured in field-type conditions, this UHPC has been observed to exhibit the properties provided in table 1. Table 1 . Typical field-cast UHPC material properties. Opportunities to modify and improve upon prefabricated element connection details exist by taking advantage of the material and durability properties that UHPC has to offer. In addition to the high compressive and post-cracking tensile strengths, the dense, discontinuous pore structure and steel fiber reinforcement of UHPC provide further material property benefits. Improvements include better internal distribution of stresses, better confinement of embedded rebar, and reduced rebar development and splice lengths. 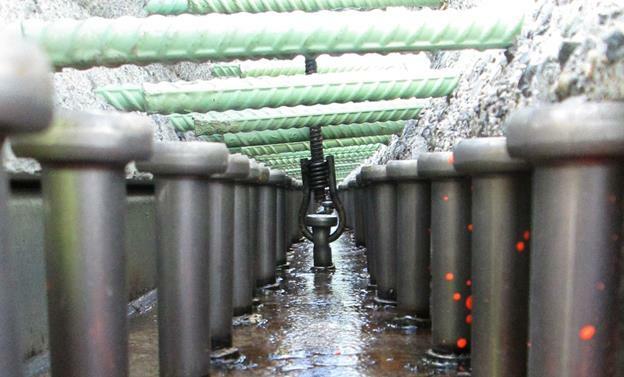 The simplest and most common connection detail involves the lap splicing of mild steel reinforcing bars. For rebar in tension, the current American Association of State Highway and Transportation Officials (AASHTO) Load and Resistance Factor Design (LRFD) Bridge Design Specifications require a minimum development length of at least 24 times the bar diameter (db). (12) Frequently, the length can be 36db or larger. Long lap lengths may lead to undesirably large connections; alternatives include using hoops, hooks, headed rebar, or mechanical couplers. 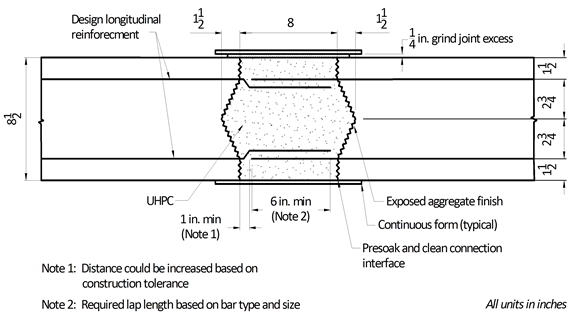 For rebar embedded in UHPC, the tension development length is a fraction of the length needed in conventional concrete. As a result, structural elements can be connected to each other by shorter, straight lengths of rebar in connections that are significantly less complicated than those that use conventional concrete or grout. (13) Reinforcement costs, difficulties in fabrication, and field assembly are all factors that can be improved by specifying field-cast, lap-splice connections with UHPC. Connections between precast bridge deck panels are one example of a field-cast lap joint that takes advantage of UHPC. Rebar from one panel overlaps with the rebar from the other adjacent panel, and the void between them is filled with UHPC. The connection transfers moment, shear, and tensile forces across the joint using short, straight rebar spaced at intervals typical to conventional deck design. One example of this connection is shown in figure 2. This connection detail was used in a set of bridges constructed on I-81 in Syracuse, NY, in 2013. This illustration shows the transverse connection detail between adjacent panels, in which the top and bottom mats of reinforcement are lap spliced within a 6-inch (152-mm)-wide connection. Figure 2 . Illustration. UHPC connection between precast deck panels as deployed by NYSDOT on I-81 in Syracuse, NY. Another example of this deck connection is shown in figure 3. This detail was used during the reconstruction of a bridge on County Road 47 (CR47) over Trout Brook near Stockholm, NY. No. 5 epoxy-coated reinforcing bars spaced at 12 inches (305 mm) in the top and bottom mats were lap spliced. The connections were specified to be 8 inches (203 mm) wide, with a minimum 6-inch (152-mm) lap splice. The additional 2-inch (51-mm) width allows the panels to accommodate in-field tolerances associated with panel placement. By keeping the connection width small, this detail addresses field fit-up tolerances, minimizes the volume of UHPC material to be mixed and placed, and requires only simple formwork to create the connection. Figure 3. Illustration. UHPC connection between precast deck panels as deployed by NYSDOT on CR47 over Trout Brook. A final example of this deck-level connection is shown in figure 4. This detail was used during the reconstruction of a bridge on U.S. Route 30 over the Burnt River and the Union Pacific Railroad near Huntington, OR. The detail included epoxy-coated No. 5 bars in the top and bottom mats. The bars were specified to have a 6-inch (152-mm) lap length within a 6-inch (152-mm)-wide female-female shear key connection. Figure 4 . Illustration. Precast deck panel for use with UHPC connections as deployed by the Oregon Department of Transportation (ODOT) on U.S. Route 30 near Huntington, OR. The conventional detail to connect prefabricated deck panels to girders requires the use of shear studs or rebar extending from the girder into block-out pockets in the deck that are filled with grout to create a composite deck/beam structure. The placement of the block-out pockets may cause clearance challenges with rebar and other associated hardware (post tensioning, lifting lugs, leveling bolts, drainage assemblies, etc.) during panel fabrication. For certain bridge configurations, the large number of shear connectors required may result in congested or even unworkable block-out pocket configurations. Deck overlays, which require an additional construction activity, are typically installed over prefabricated deck panels to address concerns about water ingress through the cold joint between the precast panel and shear stud pocket. Overlays are also used to address the long-term performance and wearability concerns regarding conventional grout surfaces in direct contact with repeated wheel loadings. Details that use UHPC can improve the conventional block-out pocket detail. Congestion issues associated with the rebar and hardware used in the prefabricated panel can be addressed through a reconfiguration of the conventional shear pocket concept. Elimination of a deck overlay can also become a viable option because of UHPC's good bonding ability to adjoining precast surfaces and the discontinuous pore structure that nearly eliminates liquid ingress. The thixotropic, self-consolidating properties allow UHPC to flow into tight spaces, thus offering the opportunity for a continuous, hidden connection detail that eliminates the conventional shear pocket detail altogether. UHPC also has the ability to improve internal stress distribution, thus enhancing the composite action between the prefabricated panel and supporting beam. This connection concept has begun to be deployed in the U.S. bridge inventory in a series of bridges in New York State on roadways ranging from county routes to interstate highways. In each of these slab-on-stringer bridges, the height of the shear connectors remains below the bottom mat of deck panel rebar to simplify the deck panel installation. Inherent in this concept is the reliance on the UHPC to carry the tensile, compressive, and shear stresses between the deck and girder connectors. One example of this connection detail is shown in figure 5. 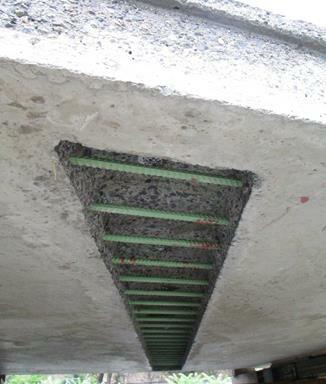 This detail was deployed on a series of interstate highway bridges near Syracuse, NY. The detail combines the panel-to-panel connection detail with the deck-to-girder connection detail into a single casting of field-cast UHPC connection that runs along the girder line. Figure 5 . Illustration. Combined UHPC deck-level and composite connections as deployed by NYSDOT on I-81 near Syracuse, NY. Another example of this connection detail is shown in figure 6. This detail is the hidden pocket version of the detail in which a continuous pocket is created above the girder line and then filled with field-cast UHPC. Composite action is generated through transfer of forces between the girder and the deck through the UHPC. This detail was deployed on the CR47 Bridge over Trout Brook near Stockholm, NY. Figure 6 . Illustration. UHPC composite connection between deck panel and steel girder. A final example of this detail is shown in figure 7 with a concrete girder that demonstrates a similar hidden pocket concept to that shown in figure 6. Although the configurations in figure 6 and figure 7 have been laboratory tested and demonstrate adequate structural performance under fatigue, service, and strength loadings, the detail in figure 7 has yet to be deployed in the U.S. bridge inventory. Figure 7 . Illustration. UHPC composite connection between deck panel and concrete girder. The concept of creating a hidden composite connection through the use of a highly flowable grout also can be used without relying on the UHPC to carry the shear forces between the deck and the girder. Whether using UHPC or a conventional grout, the connectors extending from the girders can be detailed to terminate above the bottom mat of rebar in the deck. This detail is virtually identical to the detailing inherent in traditional cast-in-place bridge deck construction. However, the grout must flow into and fill the connection void space during construction. UHPC connection details have also been developed for use in adjacent box beam bridges. Conventional connection details include grouted shear keys and intermittent transverse post-tensioning. These traditional details have often exhibited poor performance, resulting in differential deflection between beams, overlay cracking, water ingress, and eventually connection failure. Similar to the deck-level connections between precast concrete bridge deck panels, field-cast UHPC connections that bond to the precast interfaces and use a lap-splice reinforcement detail can create an improved structural connection that is capable of transferring shear, moment, and axial tensile/compressive forces across the connection. The UHPC detail eliminates the need for transverse post-tensioning or a structural concrete overlay. In effect, this detail creates a continuously reinforced concrete slab at the top flange level of the boxes. The Sollars Road Bridge over Lees Creek in Fayette County, OH, is the first box beam bridge in the United States to use this UHPC detail. This 61-ft (18.6-m) span bridge contains seven adjacent box beams. The prestressed boxes are 4 ft (1.2 m) wide and 21 inches (533 mm) deep with 7-inch (178-mm)-deep shear keys on either side. Because no transverse post-tensioning is required, these boxes did not require intermediate diaphragms. Figure 8 shows the connection detail in which adjacent box beams would be butted together and the reinforcing bars would lap within the connection. Figure 8 . Illustration. UHPC adjacent box beam connection detail. This detail is also applicable to other types of decked girder bridge systems. The detail could easily be applied to the flange tips of deck-bulb-tee girders, Northeast Extreme Tee (NEXT) beams, and pre-topped steel modular units. This detail lends itself to top-down construction in which access to the underside of the superstructure is limited or unavailable. Another potential application of field-cast UHPC connections is with link slabs above the interior supports of multi, simple-span bridge structures. The intent of the connection is to eliminate the need for strip seals or other traditional joint systems by creating a durable structural element spanning between the adjacent bridge decks. 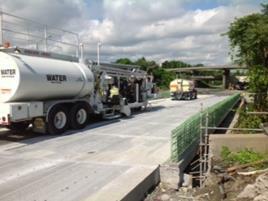 NYSDOT has used this connection detail during the deck reconstruction of the SR962G bridge over U.S. Route 17 in Owego, NY. The link slab detail is illustrated in figure 9 via a split-section view with the left side at the girder line and the right side midway between girders lines. This project used precast concrete deck panels and field-cast UHPC lap-splice connections. The composite connection detail was a hidden pocket with a conventional fluid grout. The link slab detail connects the two simple spans of the bridge above the intermediate pier. The bearings under the steel girders at the connection are designed to allow both rotation and longitudinal movement, thus minimizing the negative moments transferred between spans and the forces imparted to the connection. It is expected that if any cracking were to occur in this detail, then it would be tightly spaced and would limit any water ingress to the structure elements below. shown as split section with left side at the girder line and right side midway between girder lines. The following section provided guidance for the structural design of UHPC connection details. This guidance is based on concrete materials and structural engineering research that has been conducted on UHPC-class materials. Guidance is provided in the left column while corresponding commentary is provided in the right column. Field-cast UHPC with 2-percent (by volume) steel fiber reinforcement and a compressive strength of at least 14 ksi (97 MPa). Research has demonstrated that deformed steel reinforcement can be developed within comparatively short embedment lengths. (14) An embedment length of 8db is sufficient for most common reinforcement configurations, including the use of epoxy-coated reinforcement. Increased confinement of the bar, increased compressive strength of the UHPC, and/or decreased bar stress demand can allow shorter embedment lengths. A compressive strength of 14 ksi (97 MPa) is defined here to facilitate use of UHPC in accelerated construction when early application of construction loads to newly completed connections is advantageous. The final compressive strength of UHPC is normally greater than 22 ksi (152 MPa). The minimum embedment length of deformed steel reinforcement meeting the above conditions with 75 ksi (517 MPa) < fy ≤ 100 ksi (689 MPa) shall be taken as 10db. The increased stress and strain demand of high-strength reinforcement necessitates an increase in the embedment length. The minimum embedment length of deformed steel reinforcement with fy ≤ 100 ksi (689 MPa) and with 2db ≤ minimum cover < 3db shall be increased by 2db. A decrease in the cover results in reduced confinement of the bar and thus an increase in the embedment length. Connections between prefabricated bridge elements shall be designed to develop the yield strength of the deformed steel reinforcement bars extending from the prefabricated concrete elements. Development of reinforcing bars can be provided through sufficient embedment length, through bar hoops/hooks/heads, or through mechanical couplers. Given d, it is commonly cost effective and practical to develop deformed steel reinforcement through a straight length of embedded bar. For lap splices of straight lengths of deformed steel reinforcement, the lap-splice length, s, shall be at least 0.75 d.
Clear spacing to the nearest lap-spliced bar should be less than or equal to s. Clear spacing between adjacent bars must also meet the clear spacing requirement defined in Minimum Spacing of Reinforcing Bars. Deformed bars extending from precast elements shall be detailed to account for tolerances associated with field installation of components throughout the structure. Precast component interfaces onto which the field-cast UHPC will bond shall be detailed to include female-female shear keys for deck panel to deck panel installations. This shear key detail facilitates compression strut transfer of applied loads without relying on dowel action of reinforcing bars. It also can provide added embedment length for reinforcing bars and added interface area for enhanced interface bond. Precast component interfaces onto which the field-cast UHPC will bond shall be specified to include roughened interfaces. The UHPC contains at least 2-percent (by volume) steel fiber reinforcement. The vertical clear distance from top of the girder shear connectors to the bottom of the deck shear connectors is less than 3 inches (76 mm). The cyclic shear stress on the minimum interface shear plane under service loading is less than 0.150 ksi (1 MPa). The static shear stress on the minimum interface shear plane under strength loading is less than 0.750 ksi (5 MPa). Interfaces of precast concrete components shall be intentionally roughened to a 0.25-inch (6.4-mm) amplitude. Roughening of precast concrete interfaces allows increased UHPC bond at the interface and reduces the local interface shear stresses carried by the discrete steel reinforcement crossing the interface. Flow of field-cast UHPC within connection details shall be limited to 10-ft (3-m) lengths. UHPC has been demonstrated to be capable of flowing at least 10 ft (3 m) within a haunch connection detail. Long flow distances around discrete reinforcements can interrupt the dispersion of the fiber reinforcement, which could reduce the mechanical resistance of the UHPC. Ducted substructure connections shall be detailed to fully develop the ultimate strength of the embedded deformed steel reinforcing bar. Failure modes to consider include bar pullout from field-cast UHPC, duct pullout from conventional concrete, conventional concrete conical failure around duct, and bar rupture. The development of deformed reinforcing bars commonly used as longitudinal reinforcement in substructure components can be completed in shorter distances when embedded in field-cast UHPC contained in ducted connections. Static and seismic testing has demonstrated the emulative nature of these connections. (16) Tests were completed on field-cast UHPC with 2-percent (by volume) steel fiber reinforced, compressive strengths above 19 ksi (131 MPa), and bar sizes ranging from No. 8 to No. 11. Appropriate detailing of the duct and the surrounding precast concrete are critical to the overall performance of the connection system. The embedment length for No. 8 to No. 11 deformed steel reinforcing bars shall be at least 8db. This length is exclusive of any debonded length. Research has demonstrated No. 8 and No. 11 deformed steel bars can develop a stress exceeding 70 ksi (483 MPa) with 3db of embedment into a 4db or less diameter duct. Ducts must be corrugated and composed of galvanized steel. Duct minimum inside diameter may not be more than 4db. For seismic design, reinforcing bars shall be debonded a minimum of 4db into each component above and below the component mating interface. Debonding is necessary to avoid strain concentrations in the precast concrete adjacent to the component mating interfaces under seismic loading. Clear spacing between adjacent discrete reinforcements around which UHPC must flow during casting shall be at least 1.5 times the length of the longest fiber reinforcement in the UHPC. These equations are based on research results obtained from the testing of steel fiber reinforced UHPC with compressive strengths between 14 and 26 ksi (97 and 179 MPa). (9) The relationship presented in AASHTO LRFD Bridge Design Specifications 5.4.2.4 is limited to concrete strengths of 15 ksi (104 MPa) and should not be used for UHPC because it may overestimate the stiffness of the concrete. This equation is based on limited research results obtained from the direct and indirect tensile testing of strain hardening steel fiber reinforced UHPCs with compressive strengths between 12 and 30 ksi (83 and 207 MPa). (8,10) The tensile response of a UHPC matrix may develop more rapidly than the compressive response, thus leading to proportionally higher tensile strengths at lower compressive strengths. The cracking and sustained post-cracking tensile strengths of the type of strain hardening UHPC formulations commonly deployed in the United States has been observed to be between 1,000 and 1,500 psi (6.9 to 10.3 MPa). This tensile response is highly dependent on the efficiency of the steel fiber reinforcement. Interface surface preparations have a significant influence on interface bond strength. Rough surfaces with ample macro- and micro-texture provide extra bonding area and enhanced bond strength. In order of bond strength from high to low are exposed aggregate interface, sandblasted interface, and as-cast interface. Quantitative values have not yet been determined; however, qualitative resistance levels have been identified. Prewetting the precast interface with water to a saturated surface dry (SSD) has been demonstrated to increase the strength of the bond. Application of bonding agents or adhesives to the precast interfaces may enhance bond strength; however, field application of these substances may present practical challenges that preclude their use. The density of UHPC inclusive of the steel fiber reinforcement may be taken as 155 lb/ft3 (2,480 kg/m3). This value most closely represents the density of UHPC with 2-percent (by volume) steel fiber reinforcement. Lesser or greater percentages of steel fiber reinforcement necessarily decrease or increase the density. Inclusion of non-steel fiber reinforcement also affects the density. Use of UHPC requires the development of material and construction specifications. The material specifications define the constituent properties, testing criteria, testing levels, and payment criteria. The construction specifications provide guidance on field-related activities such as material storage, adequacy of formwork, mixing, in-field testing, placement, and curing. Common to both the material and construction specifications is the need to identify project specific criteria that may necessitate alterations of the UHPC formulation, mixing process, placing process, or curing process. Successful performance of UHPC connections requires that each stage of construction be completed in a timely and appropriate manner. The owner, the material supplier, the inspectors, and the contractor must work together to ensure success. For a public sector agency, specifying the material portion of UHPC follows either a proprietary- or performance-based method. Regardless of the specification method, the material specification should identify certain material tests that must be completed in the field and in the laboratory to ensure that the UHPC meets project requirements. The proprietary method of material specification identifies a list of acceptable products by name. Products are submitted to the agency by suppliers for a particular application, and these products perform according to published literature that is based on previously conducted test results. In many jurisdictions, a proprietary-based product can only be used if it undergoes the agency's appropriate acceptance testing protocols and is placed on a pre-approved materials/products list. Sometimes an "approved equal" provision is included in the contract plans to allow unidentified suppliers an opportunity to demonstrate whether their product meets the criteria of the contract plans and specifications. Suppliers are typically responsible for maintaining certifications as prescribed by the agency's procurement criteria. Performance-based specifications identify the testing to be performed, performance levels, and sometimes a set of mixture proportions that a UHPC product must meet. This method of procurement creates an open but more involved specification. Among many items, the specifying agency must determine all the necessary performance criteria, testing methods, and acceptance criteria. In addition, the agency must be confident that the appropriate UHPC constituents and time needed to perform the test will be available so as not to affect the overall schedule of the project. Some agencies self-perform or hire independent material testing firms to perform parts or all of the material testing required. Using the performance-based method of procurement may be necessary for initial use of UHPC if no products appear on the jurisdiction's pre-approved materials list. Specifying a set of mixture proportions is typically not recommended for UHPC because proposal of proprietary products is likely, and the constituent details of those mixes may not be known to the proposing entity. However, these criteria may sometimes be necessary, at least within defined proportion ranges, to prevent inappropriate products from being proposed to the agency. Water-to-cementitious materials ratio < 0.25. Portland cement content ≥ 1,000 lb/yd3 (593 kg/m3). Maximum aggregate size ≤ 0.25 times the fiber length. Maximum aggregate size ≤ 0.125 inches (3.2 mm). Steel fiber reinforcement geometry, strength, and volume percent. Identification of material performance tests and acceptance criteria is highly recommended. They provide a means to assess the properties of a particular UHPC mix design and can validate the appropriateness of material characteristics to the intended needs of a project. Some material performance tests are appropriate for completion in the laboratory before the construction of a project, but other tests are performed during construction. 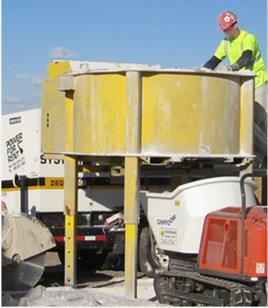 Many of the UHPC tests conducted are well-established tests used for conventional concrete. For some tests, the procedures may need to be modified to capture the true behavior of UHPC and to expedite testing. Table 2 describes commonly recommended materials tests, test frequency, acceptance criteria, and the stage of project delivery when they should be conducted. Table 2. Material tests commonly applied to UHPC used in field-cast connections. Flow range from 7 to 10 inches (178 to 254 mm). The manufacturer of the steel fiber reinforcement should provide documentation indicating the chemical composition, the tensile mechanical properties, and the geometry of the fibers. 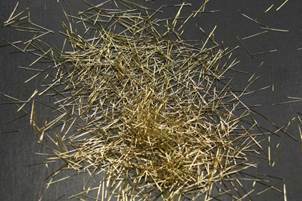 Samples may be retained during construction for future analysis if there are any questions about the properties of the fibers. Rheological properties describe the flow characteristics of a given UHPC mix design. It is important to quantify these properties because an overly stiff mix may not allow the UHPC to flow into the connections, but an overly fluid mix can result in the segregation of the steel fiber reinforcement to the bottom of the pour. A slightly modified version of ASTM C1437 (see figure 10) is used to determine the appropriate rheological properties for UHPC. 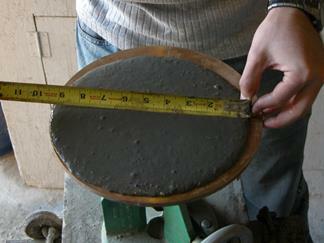 (21) The test is a miniaturized version of the spread test used for self-consolidating concrete. The C1437 test requires the dynamic spread of the mix to be measured only after the 25 table drops. As commonly implemented with UHPC, the test also includes a measurement of the initial spread of the UHPC before the initiation of the table drops. At the conclusion of this test, the UHPC can also be assessed for fiber distribution and matrix segregation. Flow tests conducted in the laboratory establish the acceptable initial and dynamic spreads for a given project application and can be used to determine the sensitivity of the mix to constituent and environmental variations. These laboratory tests can also help establish acceptable ranges of constituent variations if they are needed during construction. During construction, flow tests are conducted immediately after mixing to assess the mix before placement. Testing may also occur during placement operations to address environmental changes that may influence the mix and to assure consistency among batches. The degree of variation in flow should be within the prescribed ranges established from previously conducted laboratory tests. Adjustments to mix constituents or mixing processes to address environmental conditions may be necessary; however, any changes should be consistent with guidance provided by the material supplier and/or developed during preliminary testing. Variations in constituents may include minor modifications to the amount of water and/or superplasticizers. Figure 10 . Photo. ASTM C1437 flow test on UHPC. It has also been demonstrated that full-size cylinders can be substituted with reduced-size cylinder or cube compressive test specimens. Based on a series of companion cylinder and cube strength compression tests completed over a range of nominal strengths, the observed values fell within 5 percent of one another, allowing for direct substitution of results. (25) The reduced-size specimens save on material use, reduce waste, simplify the handling and transport of specimens, and allow the use of smaller-capacity compression testing equipment. If compression tests are used on specimens at strength levels above those appropriate for end capping, both cylinder ends must be ground to within the ASTM C39 specification of 0.5 degrees. (22) It is also important to recognize that the high compressive strengths of UHPC may necessitate the use of higher-capacity compression testing platens and machines. Both 3- (76-) and 4-inch (102-mm)-diameter cylinders are frequently used to determine the compression strength of UHPC. Typically, at least three cylinders are tested for each test condition to determine an average indication of strength. If laboratory testing is used to determine the curing behaviors of field-cast connections, then the cylinders should be match-cured in a manner that is similar to the anticipated in-field conditions. In-field activities related to the storage, mixing, and placement of the UHPC are often detailed in the construction portion of the UHPC specification. Some specifications require contractors to demonstrate competence with the mixing and placement of UHPC materials before the start of actual work. Construction specifications may include trial mixing; specification of the order and manner of constituent mixing, mixing equipment, placement, testing, adequacy of formwork, and bond surface preparation; and demonstration of appropriate staffing and equipment. For proprietary UHPCs, specifications typically require that a supplier representative be onsite during UHPC mixing and placing operations. These construction specifications may also prescribe curing methods, onsite material storage, and material usage timeframes (i.e., expiration dates). In locations where UHPC connections have been deployed, the construction community has generally developed the necessary skill set through a willingness to modify their normal construction processes according to past experience and expert advice. The following information is provided as an introduction to some of the common aspects related to the construction of field-cast UHPC connections. Material testing that occurs in the field was discussed in the previous section. The preparation of surfaces where the precast component bonds with the field-cast UHPC is critical to ensure durability and long-term performance of the system. Lack of bond allows water infiltration and potentially accelerates the degradation of the concrete and embedded rebar. UHPC can bond exceptionally well to conventional concrete at connection interfaces; however, the bond strength is highly dependent on the surface preparation of the precast concrete. Similar to other cementitious materials, UHPC is not likely to form a strong bond with smooth, dry, precast concrete. A better bond is achieved with a surface exhibiting micro- and macro-texture. Good bonding has been demonstrated when UHPC is cast against a precast concrete element with an exposed aggregate finish. An exposed aggregate finish can be created by applying a gelatinous retarder to the formwork in locations where the finish is desired. 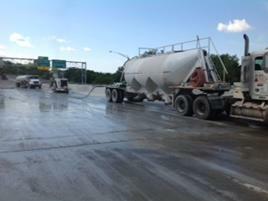 The hydration reaction of the fresh concrete contacting the retarder is delayed. After form removal, the unhydrated paste can be washed from hardened concrete with water. This process is similar to that sometimes used to create an architectural finish on a precast panel; however, here it is used to create a structural bonding surface. An example of this type of surface finish is shown in figure 11, along with a sandblasted surface finish and a steel-form surface finish. Other examples of the exposed aggregate surface finish are provided later in this document. Pre-wetting the precast concrete interface to an SSD condition immediately before the UHPC is placed also improves bonding because it eliminates the dehydrating effect that occurs when dry concrete extracts water from the newly placed UHPC. It is preferable to obtain a well-bonded interface through the normal UHPC connection construction process than to implement remedial solutions to seal unbonded areas. For this reason, it is helpful to encourage the use of construction processes that are likely to result in fully bonded interfaces. A roughened surface on the precast concrete component with current best practice providing an exposed aggregate finish. The wetting of a precast surface to an SSD condition immediately before UHPC placement. Construction activities that promote good bonding such as those mentioned above. 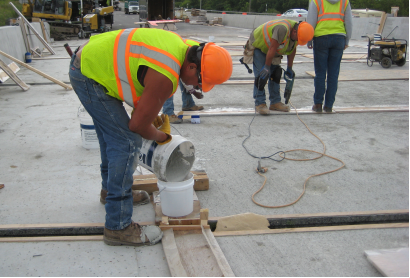 Methods to assess bond performance such as completing a water-tightness test on a bridge deck. Remedial solutions if the bond is found insufficient, such as specifying a sealing procedure for any identified unbonded areas. Figure 11 . Photo. Exposed aggregate surface finish on a precast concrete component. Fresh UHPC is a fluid, self-consolidating material that contains little or no coarse aggregate. Because of these features, the formwork used to contain the material requires tighter control than the formwork used for conventional concrete. UHPC also places higher pressures against the formwork compared with conventional concretes. Formwork that will be in contact with the UHPC should have a non-absorbing finish. Success or failure of UHPC placement is directly related to contractor and construction inspector attentiveness to ensuring that the formwork is properly sealed and capable of resisting the hydrostatic pressures from the UHPC in the unhardened state. Some contractors have gone so far as to temporarily fill connection forms with water to ensure leak tightness and to validate pressure resistance. Although not necessary, this activity can prove beneficial as a learning tool. As is common with fluid materials cast into enclosed spaces, trapped air must be provided an exit so that the space can be filled by the UHPC. Small amounts of air trapped in the UHPC and in the connection spaces during placement can result in the UHPC initially appearing to fill the void space, and then later subsiding slightly as the air escapes. To address the subsidence, forms are constructed to allow a slight overfilling of the connection and may include features to provide a slight pressure head on the pour after it is placed. An example of these details can be seen with precast deck panel connections that use UHPC. Wood strips are frequently installed on either side of the top of the connection to allow overfilling. As is done with grout, UHPC is placed starting from the low end of the pour. The formwork is capped at the low end to prevent the material from escaping as subsequent material is placed into the joint. In nearly all cases, the formwork has a "chimney" to address any subsidence effects from the release of air as described earlier. The chimney also sustains a slight pressure head on the unhardened UHPC material to ensure that the connection space remains completely filled. Figure 12 shows the filling of a bucket that serves as the overpressure source for a connection space that has been filled. The bucket is attached to the top form, and both contain a hole allowing the UHPC to flow into the connection as needed. Figure 12 . Photo. UHPC placement into a bucket that serves as the overpressure source for a connection. It can be advantageous to include formwork features on the prefabricated components to lessen the demand for field-installed formwork. For example, detailing deck panels or decked girders to include extended concrete "lips" at the bottom of the deck-level connection can eliminate the need for under-connection formwork and can simplify field construction activities by allowing for top-down construction. As with any pre-bagged cementitious composite, UHPC must be mixed according to the specifications. For UHPC, these specifications commonly provide information on the constituent volumes and the order and timing needed to mix the material. UHPC is sensitive to mixing deviations, so the timing and mix proportions must be followed. The addition of water or chemical admixtures above or below previously established ranges can be detrimental to the early and long-term performance of the material. Weather conditions can also affect the properties of the UHPC before and during the mixing operations. The temperature of the UHPC increases during mixing, and some mix water is lost because of evaporation. Best practices call for the mixing operations to occur under cool temperatures and away from direct exposure to sun and wind. Maintaining a reduced temperature of 50 to 60 °F (10 to 16 °C) on stockpiled materials and mix water is also advantageous on warm days. The fluidity of UHPC can become reduced, and the likelihood of surface dehydration can increase, if the temperature of UHPC at the conclusion of mixing exceeds 80 °F (26.7 °C). Cubed ice has been demonstrated to be a viable replacement for some or all of the mix water when mixing operations occur during warm weather conditions. UHPC can be mixed in most concrete or grout mixers. UHPC requires mixers to properly disperse the liquids uniformly within the powder matrix, with higher-efficiency mixers more effectively completing this task. Both tow-behind pan mixers and conventional concrete ready-mix trucks have been used to mix UHPC; however, higher shear mixers can be desirable because they can significantly increase the efficiency of the mixing process. As a rule of thumb, the maximum volume of UHPC that can be mixed in any of these mixers is approximately half of the volume of conventional concrete or grout that could be mixed. The mixer type selection and the number of mixers should be determined based on the rate of UHPC delivery required for the project. Figure 13 shows a portable concrete pan mixer preparing UHPC that was used in the field-cast connections for the Keg Creek Bridge in Council Bluffs, IA. Figure 13 . Photo. Portable concrete pan mixer preparing UHPC for placement during the construction of the field-cast connections. Field-cast connections on short- to medium-span bridge projects may require 10 yd3 (7.6 m3) or more of UHPC. Commonly deployed mixers can only mix a fraction of this volume per batch. Most UHPC connections details need to be divided into smaller sections so the mixing and placement rates allow the UHPC connection to be filled uniformly. Like conventional concrete or grouts, this requirement is needed to control the locations of any cold joints within the mass of field-cast concrete. Traditionally, the conveyance of UHPC from the mixer into the field-cast connection has been through motorized or non-motorized wheelbarrows. Individual connections are filled consecutively. It is possible to pump, augur, or chute UHPC; however, these methods should be demonstrated in advance and be carefully coordinated to ensure appropriate delivery of the material to the connections. Figure 14 shows UHPC placement on a bridge in Lyons, NY. Route 31 bridge in Lyons, NY. When two "heads" of adjacent UHPC pours meet one another, an interface is formed, and there is limited interface crossing by the fiber reinforcement. This situation can be avoided by prescribing that all succeeding UHPC placements should be poured into previously placed, fluid UHPC. It is rare for UHPC to require vibration to fill the area being cast. UHPC should not be internally vibrated because of the detrimental impact that this type of vibration has on the fiber reinforcement (i.e., it may settle to the bottom of the pour). External vibration is commonly impractical because of site conditions. Rodding is acceptable and is sometimes used in situations where two successive pours meet. Traditional concrete finishing practices are not used on field-cast UHPC. The low water-to-cement ratio and high supplementary cementitious content virtually eliminates bleed water from the surface of the concrete. Because of these limitations, alternate techniques must be used to ensure an appropriate concrete surface. UHPC is typically placed in a closed form, or the form is closed immediately after placement. The closed form should be designed to allow full filling of the connection space without trapping air. On flat surfaces exposed to air, UHPC should be in contact with the top formwork to minimize surface dehydration. For horizontal surfaces that are visible to the public, the connection is frequently overfilled (see Formwork section). This process allows the UHPC surface to be ground to match the adjacent prefabricated surfaces. To reduce the risk of surface dehydration, UHPC should remain sealed from exposure to the external environment until after initial set has occurred. UHPC may be, but does not need to be, moist cured because of the low permeability of the cementitious matrix. Also, UHPC should not freeze before attaining 10 ksi (70 MPa) of compressive strength. UHPC-class materials can exhibit long dwell times before the start of initial set. After initial set has occurred, strength quickly develops. The timing of initial set is dependent on the temperature of the UHPC at time of placement, the temperature conditions surrounding the material, the admixtures included, and the cement type used. Although cooler temperatures are beneficial for mixing and placing UHPC, warmer temperatures are beneficial to initiate the initial set. Supplemental heat can be provided to the UHPC and the surrounding prefabricated elements to reduce initial set times and accelerate strength gain. This heat can be supplied externally (e.g., ground heating mats) or internally (e.g., resistance heating wires). To prevent the extraction of moisture from the mix, heat sources that use forced air should not be applied to exposed surfaces of freshly poured UHPC. As with any field-cast grout, construction activities that induce relative movement into connections before the grout is set can weaken the connection. These relative movements can reduce the capacity of embedded connectors by decreasing the bond with grout. This topic is of particular relevance in the staged construction connections that are sometimes used during bridge deck rehabilitations. Ideally, relative movements should be minimized until the UHPC has set and attained 14 ksi (97 MPa) of compressive strength. Formwork may be stripped after a compressive strength of 14 ksi (97 MPa) is reached. Cementitious reactions continue to occur as the full mechanical and durability properties are achieved; however, the UHPC may be exposed to the environment without experiencing any deleterious effects. The structure may be subjected to construction and/or traffic live loads after 14 ksi (97 MPa) is reached; however, care must be taken not to overstress the connections before attainment of the design strength. 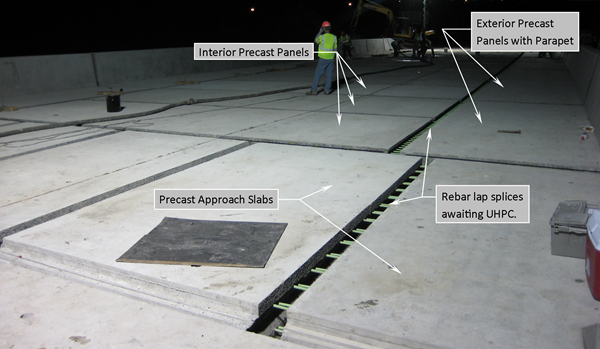 Horizontal field-cast UHPC surfaces, such as the exposed surfaces of precast deck panel connections, must be profiled for rideability. Frequently, the top face of the precast concrete deck component is designed with a sacrificial surface that can also be profiled after installation and connection casting. Grinding/grooving operations of field-cast UHPC connections (and surrounding precast component decks) have been successfully completed on prefabricated bridge decking projects. Some contractors have reported that grinding/grooving is easier if completed before the UHPC reaches its full compressive strength. The ease with which these operations can be completed depends on the UHPC strength, the UHPC formulation, and the type of grinding/grooving equipment deployed. Figure 15 and figure 16 shows two methods of surface profiling of bridge decks on interstate highways. Figure 15 . Photo. 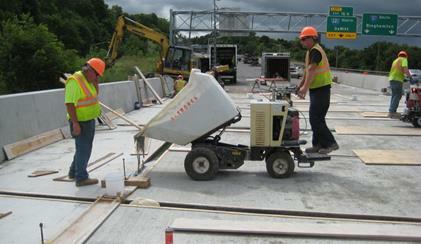 Surface profiling of a bridge deck on I-690 near Syracuse, NY. Figure 16 . Photo. Surface profiling of a bridge deck on I-81 near Syracuse, NY. Familiarity with specification for UHPC and any other relevant special provisions. The inspector must understand the documentation associated with the project and must use it as the framework through which the field construction activities are completed. Worker safety equipment and procedures. The inspector must be familiar with safety precautions relevant to the deployment of UHPC in this type of construction project. In particular, the powdered constituents of UHPC are exceptionally fine and can become airborne more easily than traditional portland cement. Also, the steel fiber reinforcement commonly has a very small diameter and, if handled incorrectly, can lead to punctures of clothing, safety equipment, and skin. Prior coordination of construction activities. Construction projects of this type commonly include coordination activities before the initiation of the construction process. These coordination activities may include practice batching, mixing, and placing of the UHPC either on or adjacent to the site by the construction crew that will thereafter be completing the UHPC connections. Testing all relevant equipment immediately before the start of construction activities is also important. Lot numbers, dates, and storage of constituent materials. The inspector must ensure that the constituents are tracked before use and are recorded in concert with the use of the constituents. Also, the constituents must be stored appropriately to avoid degrading the products before use. This step is particularly important to avoid any unintentional hydration of the UHPC cementitious composite before the initiation of mixing. Mixing process, including weighing, timing, and discharge. The inspector must ensure that the proper constituents are added to the mixer within the predetermined proportion ranges and timeframes. The mixing operation should be timed because the mix time across batches provides an indication of the consistency of the product being delivered. The temperature at discharge is also an indicator of consistency and, if too high, can be an indicator of likely future placement difficulties. Formwork considerations. 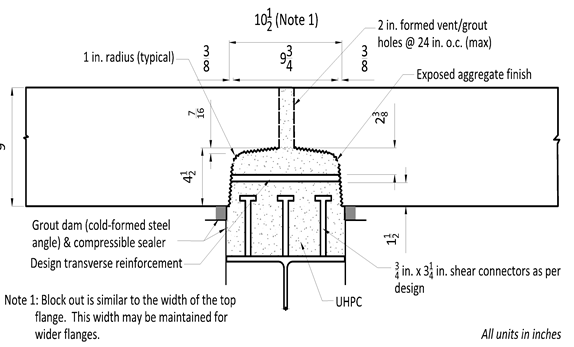 Forms for field-cast UHPC must be tighter than normal because of the rheology of UHPC. Formwork leakage and the resulting common remedies are less effective because of the rheology of UHPC. Long connections are commonly divided into smaller length spaces in order to allow for rapid filling and closure of individual connections. Surface preparation. The precast concrete surfaces against which the UHPC will be cast must be appropriately prepared to achieve appropriate bond performance. The inspector should ensure that the interface surfaces meet the construction requirements for roughness and that they are free of foreign materials. Prewetting of these surfaces to an SSD condition immediately before UHPC placement is commonly specified and must be monitored by the inspector. Pour locations and volumes per pour location. The inspector must ensure that the construction process follows the recommended practice regarding UHPC volumes per connection location. Overly large connections result in difficulty bringing any one connection space to a fully filled condition. The inspector must be aware of pour locations, connection geometry, and pour volumes to ensure that the UHPC connections are being filled in an appropriate, sequential, and timely fashion. Placement of UHPC. The UHPC should be placed into each connection space without the use of vibration. 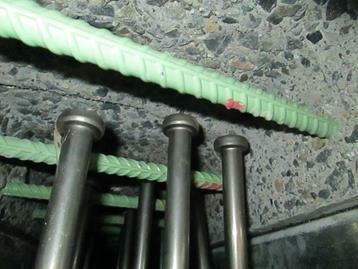 Vibration can cause disruption in the dispersion of the steel fiber reinforcement. If placed through discontinuous pours, successive additions of UHPC should be poured into fresh, previously placed UHPC. UHPC can be rodded at locations where successive pours meet. Form closure requirements, including overpressure. The inspector must monitor the process as each connection space is filled and any top forms are installed. UHPC can subside because of either continued flow into unfilled areas or release of entrapped air. Full filling plus overpressure from a chimney is commonly recommended and thus must be monitored. Curing requirements. The inspector must ensure that the field-cast UHPC is cured appropriately to develop material properties in a reasonable timeframe. 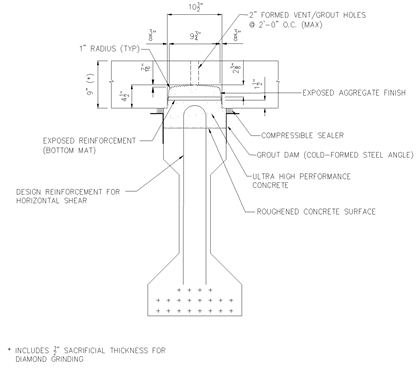 Surface preparation of hardened UHPC. Uppermost UHPC surfaces within a connection space, such as the connection surface on a bridge deck, commonly require dressing to create an appropriate surface profile. This step may include grinding and grooving. These operations are easier to complete after the UHPC has hardened and before it has gained its full strength. Early dressing can result in tearing of the UHPC, and late dressing can unnecessarily cause wear to the dressing equipment. Inspectors should monitor the timing of these operations. Field test methods for assessing fresh properties. The inspector must be familiar with the test methods used to assess the fresh properties of the UHPC. The inspector must ensure that the tests are completed correctly and at appropriate times and that the test results are recorded. NYSDOT is a leader in the deployment of innovative solutions that use of field-cast UHPC connections. After constructing dozens of bridges using UHPC, the design and construction community is growing more familiar with this material and is finding new ways to use it. This familiarity has led to many successful projects and new ideas that improve design, fabrication, and construction efforts needed for bridge construction. This section describes a case study on four interstate bridges that were recently constructed near Syracuse, NY, that use UHPC details, precast full depth deck panels, no post-tensioning, and no panel leveling screws. Four bridges on I-81 were rapidly re-decked using precast concrete deck panels and field-cast UHPC connections. One pair of bridges spanned East Castle Street, and the other pair spanned East Brighton Avenue. NYSDOT chose to reconstruct the decks of the two bridges on the southbound alignment using a 10-day closure and then repeat the same accelerated process for the northbound structures. All four bridges have steel superstructures that were being retained while their decks, parapets, and approach slabs were replaced. Figure 17 shows one of the bridges after the demolition of the existing deck and before the installation of the new precast deck panels. The steel shear studs are installed along with the cold-formed steel angles that will serve as the haunch formwork. The next phase of the deck reconstruction is the installation of the precast deck panels and precast approach slabs. 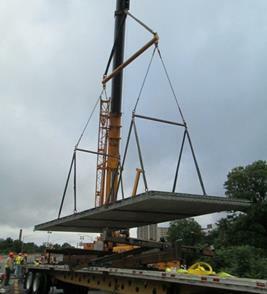 Figure 18 shows one of the deck panels being lifted from the truck. This panel spans transversely across the bridge between the interior girders of the bridge. Figure 19 shows the installation of a deck panel that spans over the exterior girder and first interior girder. The panels from figure 18 can be seen just to the left of the first interior girder line. Note that the barrier has been cast integral to the panel shown in figure 19. These exterior panels were fabricated upside down. This method of fabrication offers benefits to the owner and the contractor (e.g., the top of the deck and the parapet are composed of high quality, well-consolidated concrete). The connection details used in this reconstruction project use the field-cast UHPC connection concepts presented earlier in this document. The connection details between the precast panels use a noncontact lap splicing of straight lengths of epoxy-coated reinforcement embedded in UHPC. This detail is shown in figure 20. Note that exposed aggregate surface was used to increase the bond at the mating surfaces. The deck-to-girder connections above the first interior girder also use a field-cast UHPC connection detail, shown in figure 21. The detail at this location combined the deck-level connection with the deck-to-girder connection in a unique way that facilitated construction and maximized the value of the UHPC. A hidden pocket composite connection detail was used above the other girder lines on these bridges. Although this detail was forced to use conventional grout because of now-superseded Buy America provision-related constraints, the connection details do demonstrate a concept worthy of note. Figure 22 shows the bottom mat of reinforcement in the deck panel and the exposed aggregate surface that is used to improve the interface bond. Because this detail uses conventional grout, the shear stud heads are required to extend above the bottom mat of reinforcement, as shown in figure 23. As discussed earlier in this document, the embedment of the shear studs above the bottom mat would not need to occur if UHPC was used in the connection. This detail can be seen in figure 6 and in figure 21. The construction method used on these bridges allowed all of the prefabricated deck elements to be installed in a continuous operation. Figure 24 shows a deck after the installation was complete but before the initiation of connection grouting operations. The mixing, transport, and placement of the UHPC into the connections for each bridge deck was completed over the course of a few hours, as shown in figure 25 and figure 26. The UHPC was mixed adjacent to the bridge site in a pair of mixers that alternately discharged approximately 0.65 yd3 (0.5 m3) of UHPC. Motorized buggies transported the UHPC to the connections. The UHPC was then poured into the connections until the local area was filled. The filled connection was then covered with plastic and a plywood lid to facilitate appropriate curing of the cementitious composite. After the UHPC had developed sufficient strength, the formwork was removed, and the entire surface of the bridge deck was ground and grooved. This operation allowed the creation of a consistent, uniform driving surface over the entirety of the bridge deck, approach slabs, and approach pavement. The grinding included removal of concrete from both the UHPC connections and the precast deck panels, which also included sacrificial concrete. Figure 27 shows a completed bridge deck with two of the lanes open to traffic. Figure 17. Photo. Superstructure prepared for precast panel installation. Figure 18 . Photo. Transport and rigging of precast deck panel. Figure 19 . Photo. 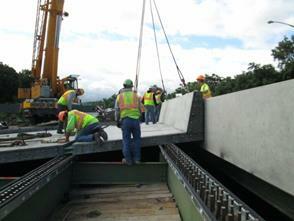 Installation of precast panel with integral barrier. Figure 20 . Photo. Deck-level connection between precast deck panels. Figure 21 . Photo. Longitudinal connection detail above first interior girder line with shear studs stopping below the bottom mat of rebar. Figure 22 . Photo. Connection detail on underside of precast deck panel. Figure 23 . Photo. Hidden pocked connection detail with shear studs extending above the bottom mat of rebar to allow use with non-UHPC grouts or concretes. Figure 24 . Photo. 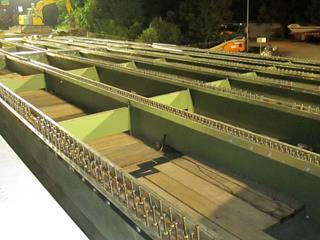 Bridge deck after panel installation and before UHPC placement. Figure 25 . Photo. Mixing operation for the field-cast UHPC. Figure 26 . Photo. Placing operation for the field-cast UHPC. Figure 27 . Photo. 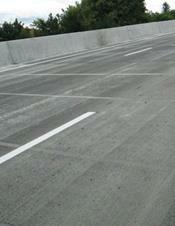 Bridge deck after grinding, grooving, and opening to traffic. Over the past few years, dozens of highway bridge projects using field-cast UHPC connections between prefabricated elements have been completed in the United States. Table 3 lists the projects that have been completed through mid-2014. Additional projects are under construction. Table 3 . Deployments of field-cast UHPC connections in the U.S. highway infrastructure. Field-cast UHPC connections provide new opportunities to create robust structural systems composed of prefabricated components. Research has demonstrated the performance of these connection concepts in the laboratory. Initial deployments in the highway bridge inventory have demonstrated the constructability and field performance of these systems. This document provides design and construction guidance relevant to field-cast UHPC connections. It is expected to facilitate broader deployment of prefabricated bridge elements by providing owners and contractors with the tools necessary to specify, design, and construct a new class of robust connection details. Russell, H., and Graybeal, B., Ultra-High Performance Concrete: A State-of-the Art Report for the Bridge Community, FHWA-HRT-13-060, McLean, VA, June 2013. Graybeal, B., Ultra-High Performance Concrete, FHWA-HRT-11-038, McLean, VA, March 2011. Graybeal, B., Construction of Field-Cast Ultra-High Performance Concrete Connections, FHWA-HRT-12-038, McLean, VA, April 2012. Wille, K., Development of Non-Proprietary Ultra-High Performance Concrete for Use in the Highway Bridge Sector, Report No. PB2013-110587, NTIS, Springfield, VA, October 2013. ASTM Standard C150 (2012), Standard Specification for Portland Cement, ASTM Book of Standards, Volume 04.01, West Conshohocken, PA.
API Specification 10A (2010), Specification for Cements and Materials for Well Cementing, American Petroleum Institute. U.S. Department of Transportation, Federal Highway Administration, Ultra High Performance Concrete (UHPC)-Availability of Domestic Source of Steel Fiber Reinforcement and Proprietary Product Concerns, Memorandum, February 2014. Graybeal, B., Material Property Characterization of Ultra-High Performance Concrete, FHWA-HRT-06-103, McLean, VA, August 2006. Graybeal, B., and Stone, B., Compression Response of a Rapid-Strengthening Ultra-High Performance Concrete Formulation, FHWA, NTIS, Accession No. PB2012-112545, September 2012. Graybeal, B., and Baby, F., "Development of a Direct Tension Test Method for Ultra-High-Performance Fiber-Reinforced Concrete," ACI Materials Journal, 110(2), March 2013, pp. 177-186. Swenty, M., and Graybeal, B., Material Characterization of Field-Cast Connection Grouts, FHWA, NTIS, Accession No. PB2013-130231, January 2013. AASHTO Highway Subcommittee on Bridges and Structures, AASHTO LRFD Bridge Design Specifications, AASHTO, Washington, DC, 2013. 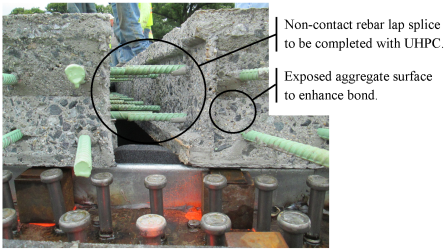 Graybeal, B., Behavior of Field-Cast Ultra-High Performance Concrete Bridge Deck Connections Under Cyclic and Static Structural Loading, FHWA, NTIS, Accession No. PB2011-101995, November 2010. Yuan, J., and Graybeal B., Bond Behavior of Reinforcing Steel in Ultra-High Performance Concrete, FHWA-HRT-14-089, McLean, VA, 2014. Graybeal, B., Ultra-High Performance Concrete Composite Connections for Precast Concrete Bridge Decks, FHWA, NTIS, Accession No. PB2012-107569, April 2012. Tazarv, M., and Saiidi, S., "Emulative Moment-Resistant RC Bridge Column-Footing Connection for Accelerated Bridge Construction in High Seismic Zone," Proceedings of the 7th National Seismic Conference on Bridges & Highways, Oakland, CA, 2013. Thomas, M., Green, B., O'Neal, E., Perry, V., Hayman, S., and Hossack, A., "Marine Performance of UHPC at Treat Island," Proceedings of Hipermat 2012 3rd International Symposium on UHPC and Nanotechnology for High Performance Construction Materials, Ed., Schmidt, M., Fehling, E., Glotzbach, C., Fröhlich, S., and Piotrowski, S., Kassel University Press, Kassel, Germany, 2012, pp. 365-370. Kono, K., Musha, H., Kawaguchi, T., Eriguchi, A., Tanaka, S., Kobayashi, T., and Ikeda, M., "Durability Study of the First PC Bridge Constructed with Ultra High Strength Fiber Reinforced Concrete in Japan," Proceedings of the RILEM-fib-AFGC International Symposium on Ultra-High Performance Fibre-Reinforced Concrete, Ed., Toutlemonde, F., and Resplendino, J., RILEM Publications, Begneux, France, 2013, pp. 239-248. Piérard, J., Dooms, B., and Cauberg, N., "Durability Evaluation of Different Types of UHPC," Proceedings of the RILEM-fib-AFGC International Symposium on Ultra-High Performance Fibre-Reinforced Concrete, Ed., Toutlemonde, F., and Resplendino, J., RILEM Publications, Begneux, France, 2013, pp. 275-284. ASTM Standard C1437 (2007), Standard Test Method for Flow of Hydraulic Cement Mortar, ASTM Book of Standards, Volume 04.01, West Conshohocken, PA.
ASTM Standard C39 (2010), Standard Test Method for Compressive Strength of Cylindrical Concrete Specimens, ASTM Book of Standards, Volume 04.02, West Conshohocken, PA.
ASTM Standard C109 (2008), Standard Test Method for Compressive Strength of Hydraulic Cement Mortars (Using 2-in. or [50-mm] Cube Specimens), ASTM Book of Standards, Volume 04.01, West Conshohocken, PA.
Graybeal, B., "Compressive Behavior of Ultra-High Performance Fiber-Reinforced Concrete," ACI Materials Journal, 104(2), March 2007, pp. 146-152. Graybeal, B. and Davis, M., "Cylinder or Cube: Strength Testing of 80 to 200 MPa (11.6 to 29 ksi) Ultra-High-Performance Fiber-Reinforced Concrete," ACI Materials Journal, 105(6), November 2008, pp. 603-609. 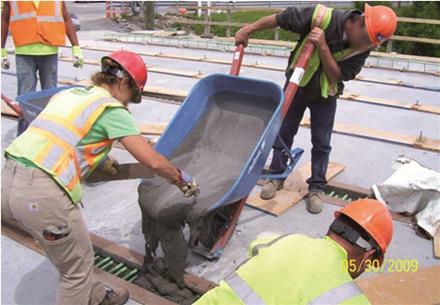 ACI 305R-10 (2010), Guide to Hot-Weather Concreting, American Concrete Institute, Farmington Hills, MI. (202) 493-3122 or in the FHWA Office of Infrastructure Research and Development located at 6300 Georgetown Pike, McLean, VA 22101. Distribution-This TechNote is being distributed according to a standard distribution. Direct distribution is being made to the Divisions and Resource Center. Availability-This TechNote may be obtained from the FHWA Product Distribution Center by e-mail to report.center@dot.gov, fax to (814) 239-2156, phone to (814) 239-1160, or online at https://www.fhwa.dot.gov/research. Key Words-Ultra-high performance concrete, UHPC, fiber-reinforced concrete, bridge, accelerated construction, durable infrastructure system, prefabricated bridge elements and systems, design guidance, construction guidance, connection details. Notice-This document is disseminated under the sponsorship of the U.S. Department of Transportation in the interest of information exchange. The U.S. Government assumes no liability for the use of the information contained in this document. The U.S. Government does not endorse products or manufacturers. Trademarks or manufacturers' names appear in this TechNote only because they are considered essential to the objective of the document. 1 The tensile behavior of UHPC may generally be defined as "strain-hardening," a broad term defining concretes in which the sustained post-cracking strength provided by the fiber reinforcement is greater than the cementitious matrix cracking strength. Note that the post-cracking tensile strength and strain capacity of UHPC is highly dependent on the type, quantity, dispersion, and orientation of the internal fiber reinforcement.